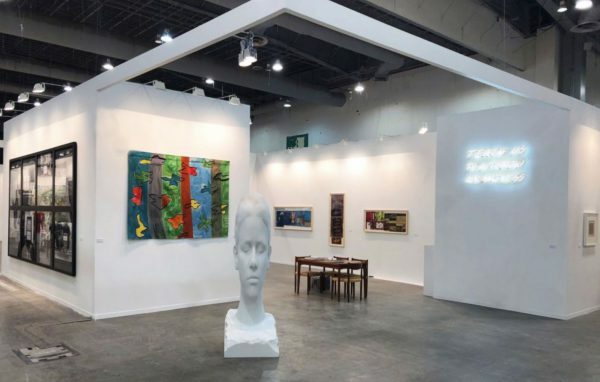 Mexico City’s Zona Maco is buzzing with dynamic voices from the region. Zona Maco is exhilarating, inviting, and full of heavy-hitting art. Economic policies introduced by Mexico’s new president have yet to dent dealers’ sales at Zona Maco. As Zona Maco opens, the best exhibitions to see across Mexico City. How Graciela Iturbide became one of Mexico’s greatest photographers. Grace Jones graces the stage for Aids charity at Mexico City home of Eugenio López. The Desert X Biennial opens in the Coachella Valley with art scattered across 55 miles. Desert X art show puts a Jenny Holzer installation on hold over animal welfare worries. The “Art Supermarkets” catering to China’s growing middle class. Here’s the exhibitor list for Frieze New York 2019. Christie’s posts record sales total of £5.3 billion for 2018. Sotheby’s is entering the AI art fray, selling a surreal artwork by one of the movement’s pioneers this spring. Singer George Michael’s collection of YBA Art goes to auction in London next month. Nan Goldin’s activistism escalates its war against the Sacklers with an open call to action at the Met. New Orleans Museum of Art to open expanded sculpture garden this May. Typing tools, tropical trees and a whole lot of sunshine – the new Norton Museum of Art. National Museum of Scotland completes 15-yr makeover revealing whole world under one roof. Museums are becoming more diverse, but there’s still work to do. Marian Goodman Gallery hires museum vet Philipp Kaiser. PODCAST: Tracey Emin on mourning and #MeToo; George Shaw on realism and Rembrandt. PODCAST: The rise and rise of the Los Angeles art world. Rapper and Actor Edison Chen shares what he’d do with 24 hours in Los Angeles. Here are 10 young movers and shakers taking the Los Angeles art scene by storm. Meet Vladimir Kush, the painter suing Ariana Grande. Ivanka Trump decries Jennifer Rubell performance being staged in Washington D.C.
Tracey Emin lays bare her own traumas in piercing new show. Tracey Emin to turn Margate studio into a museum for her work when she dies. For Serpentine performance, Marina Abramović to appear in augmented reality experience. Met selects Alicja Kwade for 2019 roof garden commission. 15 must-see Rembrandt shows during the 350th anniversary of his death. Robert Ryman, relentlessly inventive abstract painter, is dead at 88. The man who keeps Robert Irwin’s stunning, 500-plant garden alive. Why it’s refreshing when white male artists doubt themselves. Exploring Aaron Johnson’s studio and otherworldly artworks. How Josef Albers created the modern art school as we know it. The salacious violence of Lucio Fontana’s slashed canvases. What Andy Warhol really ate. The do’s and don’ts of death. How quitting Instagram made me appreciate art again. How Van Gogh’s sunflowers have inspired generations of British artists. 4 artists around the world that are worthy of your eyes right now. teamLab’s ‘Forest of Resonating Lamps’ installation shines pink for spring 2019. In picture books and paintings, Oliver Jeffers explores our place in the cosmos. Billionaires are storing hundreds of millions of dollars’ worth of art on superyachts. Billionaire Tom Hill shares the stories behind 5 beloved works in his new museum. Why artists are struggling to make a living from their art, and the activists fighting back. Art to die for? – Velvet Buzzsaw reviewed. How to set up a painting studio at home. Categories: Contemporary Art, Features, Overtime. Tags: Contemporary Art, Features, Overtime.